Writing a comic book script can be a bit daunting for newcomers. Aside from learning the language of comic book storytelling and sequential art, you also have to write a script that communicates your story and ideas to the artist clearly and effectively. 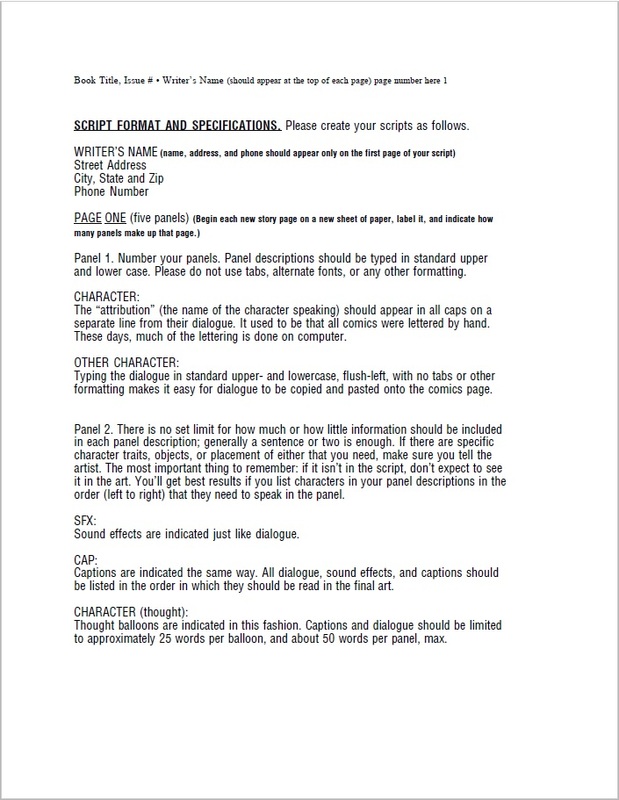 How do you format a comic book script? Don't panic! The answer is pretty simple--there are no rules. That's one of the great things about writing comics. As long as you have a format and style that works for you and the artist, any format will do. I'm someone who likes to learn by example. One of the best ways to learn is to just read scripts. Get your hands and eyes on as many different scripts as you can. The Comic Book Script Archive is a great place to read scripts by established professionals. 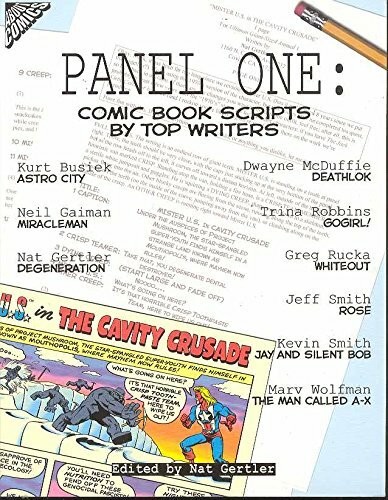 You can also find book collections on Amazon that have published scripts, and some deluxe hardcovers of comics have script pages and process material in the back. What do you do after you've read a bunch of different scripts? That's when it's time to find a style that you like and stick with it. I've gathered some images and info of five formats that are great for beginners. Most of them don't require any expensive software, so you can start writing right away! Before we do that, let's break down comic book scripts into two major categories--Full Script and Plot Script. Full Script is the method where every panel, piece of dialogue, and page are clearly described for the artist and the reader. It doesn't have to be as formal as a screenplay since the main audience for the script is the artist. Full script looks the most like a screenplay, stage play, or radio play. Plot Script is when there's a detailed outline or description of the overall story, which is then broken down and paced out by the artist into panels and pages. Sometimes dialogue is included up front, sometimes it's added afterward. This is a method made famous by Marvel's Stan Lee and other creators like Harvey Kurtzman and E.C. 's William Gaines. There are a lot of ways this can be customized, but the major factor that separates it from full script is that it's a summary of the overall story without panel or page breakdowns (although some have that, too). Now that we know the two basic types of comic book scripts, here are a few starter examples to help you format your first comic book script. These aren't industry standard names or labels, they're just available templates and guides that are great for beginners. This is the format that I started with and it's definitely the easiest. You don't need to know any fancy keystrokes or formatting techniques. It's clear, concise, and doesn't require anything but a word processor. You can find a link to the Dark Horse Format Guide here on the Dark Horse Submissions section of their website. 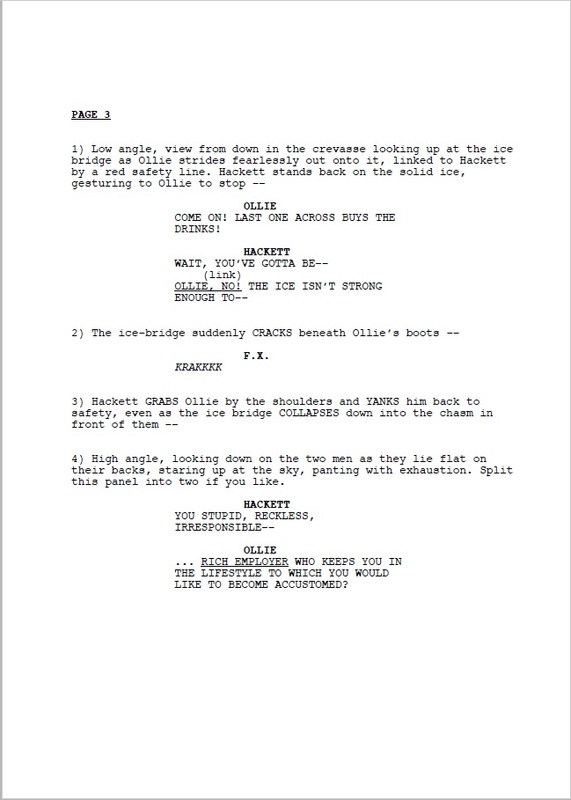 This is a popular choice for writers that like to see a script that's closer to a screenplay. The elements are the same as any comic book script, but they're arranged in a way that's closer to screenplay format rules and regulations. One thing that's great about this format is that it gives you a good idea of what your word balloons will look like. (Make sure to keep dialogue to around or under 25 words per balloon). This was developed by Paul Allor for Comics Experience, which is a take on the style that former Marvel and IDW editor Andy Schmidt. The workshop and classes are indispensable for people who want to learn about the craft of comic book writing, artwork, lettering, coloring, and production. The template uses bold panel descriptions to make them stand out from the dialogue. It's similar to the Dark Horse format in that it's easy to do yourself and is very clear. You just need a word processor and a few simple formatting techniques to get the ball rolling with this template. If there's a style that's easy to format, it's this one. Just start typing! Some people include dialogue up front, some add it afterward, but if you're working with an artist or you're an artist/writer that doesn't need a full script, this can be a big time saver. 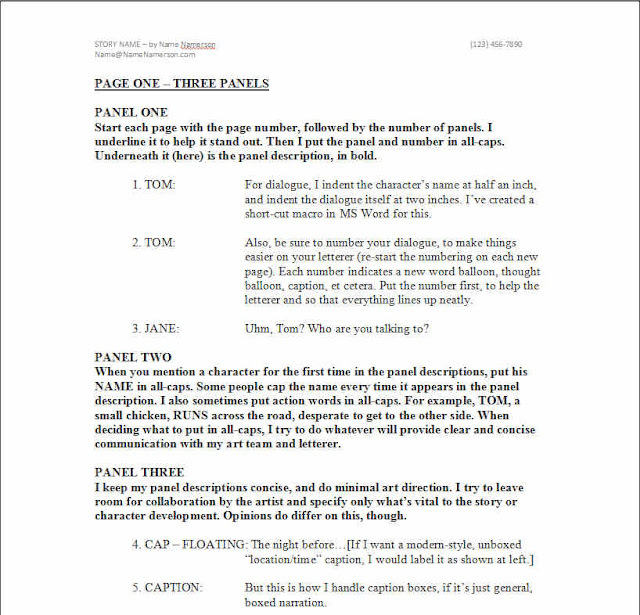 Here's an example from Alan Davis's website of a plot script with the added dialogue on a separate page. Marvel Method/Plot Script (left) and the dialogue to be added in later (right). One thing to keep in mind is that a lot of the storytelling will be placed on the artist. Make sure that you and the artist are both 100% dedicated to working with this method before you email them a copy of your script for the first issue. This is the format I currently use. It's a very clean and modern take on the comic book script, mixing a few styles that I've shown above. I have a formatted version in Microsoft Word that automatically generates numbered dialogue, but you can use this as a guide for formatting however you want. Check out the Blambot article for a breakdown of the script elements. 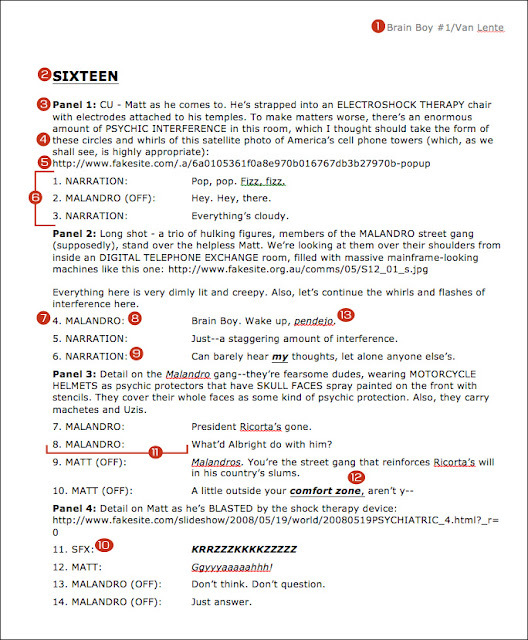 Nate Piekos of Blambot did a great article about the elements in this comic book script (which works for all scripts) that you should definitely read. I mentioned this earlier, but the Comic Book Script Archive and Comics Experience are great tools for people who want to read scripts and discussing writing. Check out scripts by some of your favorite writers and see how they structure their pages, panels, scenes, sequences, and stories. Remember that there's no right way to format a comic book script. These five methods are just guides for any writer that's struggling with how to start or present their script on the page. Do you use a different format or method? Comment below and let me know about it for future reference. Porter, You talk about Book Script. Book script is important topic for me . All students like book script. Thansk for sharing this important post. 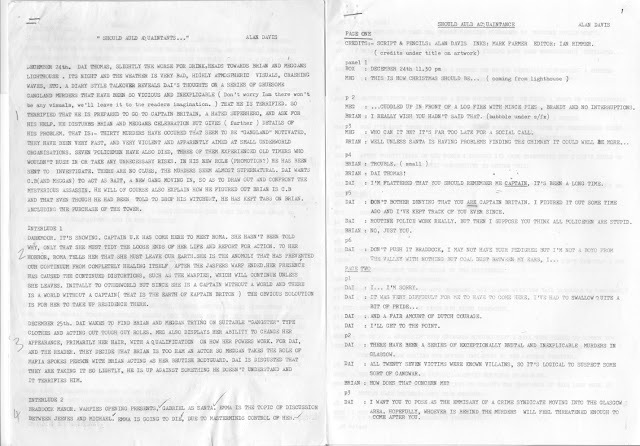 Please explore more about Script Writing Samples information. Wao I did not know that its too much easily to format a book.You shared brilliant good service which I would like to share with my professional friends.Thanks and keep sharing more. Bloomington is always a favorite place of mine and where I always wanted to stay in but there has not that much chance for that. http://www.manuscriptwriting.net/writing-manuscripts-with-us/writing-a-scientific-manuscript/ that helps me a lot on my academic papers writing. I am very pleased to read that article. Writing a comic story is hectic and bit difficult for writers. but no doubt, It attracts the attention of the reader more. I just loved the way of your writing. In that days, people wants to read and watch the comic story to kill the boredom. If you wants to follow us. so please visit page and get useful tips. Comic books are some of the special piece on writing as the idea of these comic books are really unique and so great piece of work. your idea and writing ab[out COMET is really impressive , your data analysis also good . i learn something new about COMET . keep shearing like this http://business.proposalwritingservice.com/ for the students that is very helpful for the writing services.